Craving mac and cheese? Sometimes only comfort food will do. When that hunger strikes, it’s always smart to have a few go-to spots in your back pocket to indulge your cheesy dreams. Find 10 of our favorites below. Taste This Balt in Baltimore, Maryland, fuses scrumptious Baltimore seafood with southern-comfort mac and cheese. The Canton is served with crabmeat, shrimp, butter, mac and cheese, old bay and cheddar cheese. Fox’s Den American Craft Gastropub bills itself as Annapolis’s premier gastropub. Their incredible mac and cheese is served with pork rind bread crumb, gruyere, fontina, and cheddar cheese. The Say Cheese! Food truck is Gaithersburg, Maryland’s go-to spot for all things cheesy. Order mac and cheese as a side dish, served alone, with brisket and barbecue sauce, Buffalo chicken, or bacon, or go for the Country Cowboy sandwich (smoked brisket, homemade mac and cheese, barbecue sauce, cheddar and pepper jack cheese in ciabatta). Peter’s Carry-Out Restaurant and Sub Shop is a Bethesda, Maryland, delight. Their menu is diverse and large, including breakfast, subs, burgers, wraps, salads, and more. Their Weezy Homemade Mac and Cheese is down-home cooking at its finest. BeClaws has locations in Hyattsville and Silver Spring, Maryland, and offers Cajun cuisine with an Asian twist. 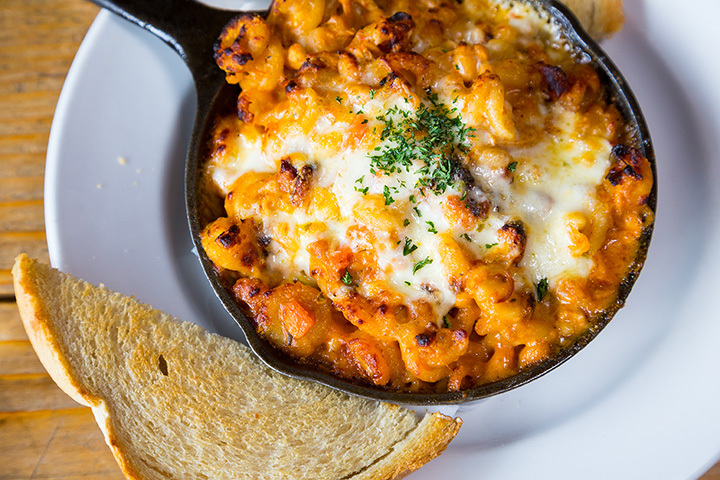 Their crawfish mac and cheese combine flavors exquisitely. Enjoy delicious seafood on the Ocean City boardwalk right on the water. Mac and cheese lovers won’t be able to stop eating their Crabbie Mac and Cheese which is made with three cheeses and jumbo lump crab! 7. NuVegan Cafe, College Park, MD and Washington, D.C.
NuVegan Cafe plans to become “the motivating force that sparks a movement towards global awareness” of vegan cuisine. Ambitious and forward-thinking plans aside, their food is down-right tasty, with the vegan mac and cheese being one of the tastiest. Mad Cow Grill in Laurel, Maryland, serves up scrumptious burgers with truffle mac and cheese on the side. Enjoy as a side dish or order alone, either way you’ll eat happy. Washington Chicken in Hagerstown, Maryland, serves chicken of all kinds, sandwiches, and salads. Their homemade mac and cheese comes as a side dish but will easily become one of the top reasons for stopping by. The Candied Yam is soul food done right. The homemade mac and cheese is a favorite of regulars. This mac doesn’t have any fancy frills—it sticks to the combination that made mac and cheese a comfort food staple.